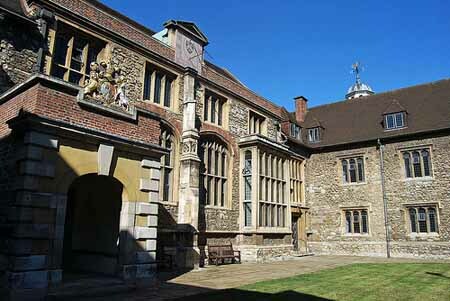 The Charterhouse began as a Carthusian priory, founded in 1371 by the Norman nobleman Sir Walter de Manny who endowed a monastery for the strict order of the Carthusian monks. Here the holy brethren would offer prayers for the souls of the victims of the 1348 Black Death who still lie buried in the great square outside the gates. The plague pit dates back to 1348, where some 50,000 victims were buried, some still alive. Locals say they can still hear their screams on dark, still nights. The monastery flourished until the Reformation, when its monks refused to accept Henry VIII as head of the church in England. Their Prior, John Houghton, was hanged, drawn and quartered, and one of his arms was even nailed onto the monastery gates in attempt to persuade the surviving monks. Inspired by their leader's bravery and ghostly nocturnal visits from their long dead brothers, the friars held strong and refused to curtail to the King's demands. One dark, wintry night, as they prayed in the chapel by dim candlelight, their came a flash of heavenly flame which caused every candle to flare up with a celestial brilliance. Encouraged in their battle with the State, the monks remained steadfast, even though sixteen more of their brotherhood were executed before the monastery was finally dissolved. At nights when the surrounding streets fall silent the ghost of a shadowy monk has been seen drifting aimlessly along the cobblestone courtyards, parts of which survive from the days of the monastery. In 1545, the entire site was bought by Sir Edward (later Lord) North (c. 1496-1564), who transformed the complex into a luxurious mansion house. North demolished the church and built the Great Hall and adjoining Great Chamber. In 1558, during North's occupancy, Queen Elizabeth I used the house during the preparations for her coronation. Following North's death, the property was purchased by Thomas Howard, 4th Duke of Norfolk, who renamed it, Howard House. In 1570, following his imprisonment in the Tower of London for scheming to marry Mary, Queen of Scots. Norfolk was placed under house arrest at the Charterhouse. He occupied his time by embellishing the house, and built a long terrace in the garden (which survives as the "Norfolk Cloister") leading to a tennis court. In 1571, Norfolk's involvement in the Ridolfi plot was exposed after a ciphered letter from Mary, Queen of Scots was discovered under a doormat in the house; he was executed the following year. Residents claim that the Charterhouse itself is haunted by the ghost of its former owner Thomas Howard, 4th Duke of Norfolk, who strides down the main staircase, head tucked under his arm, as he returns to where he was arrested.